Non-residential PV saw an annual decline of 8%, mainly due to policy shifts in states like California and Massachusetts. 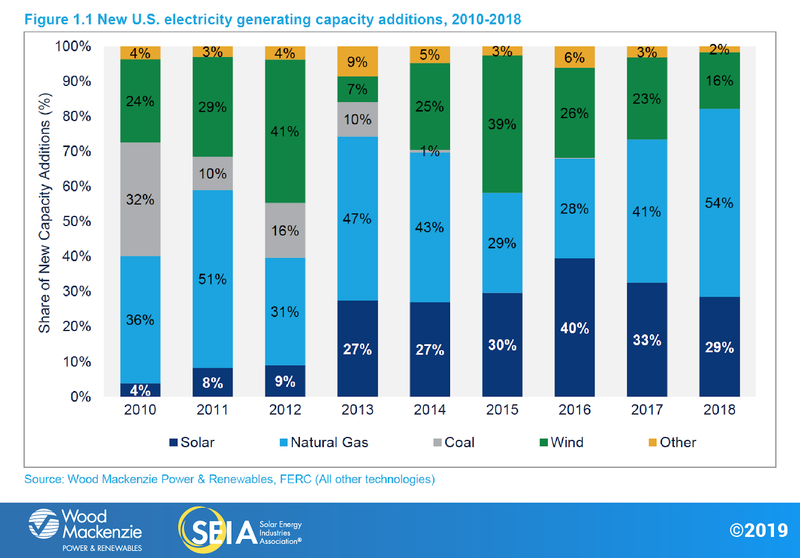 In 2018, the U.S. solar market installed 10.6 gigawatts direct current (GWdc) of solar photovoltaic (PV) capacity, a 2% decline from capacity additions in 2017. After a year in which the residential sector experienced 15% contraction, 2018 marked a year of rebound as the residential market grew by 7%. Conversely, non-residential PV saw a slight annual decline of 8%. Utility solar also saw slight annual contraction, due to the impacts of Section 201 tariff uncertainty earlier in the year and shifting project timelines based on the tariff schedule. Overall, in 2018, solar PV has accounted for 29% of new electricity generating capacity additions – a lower share compared to 2017 due to a surge in new natural-gas plants in early 2018. 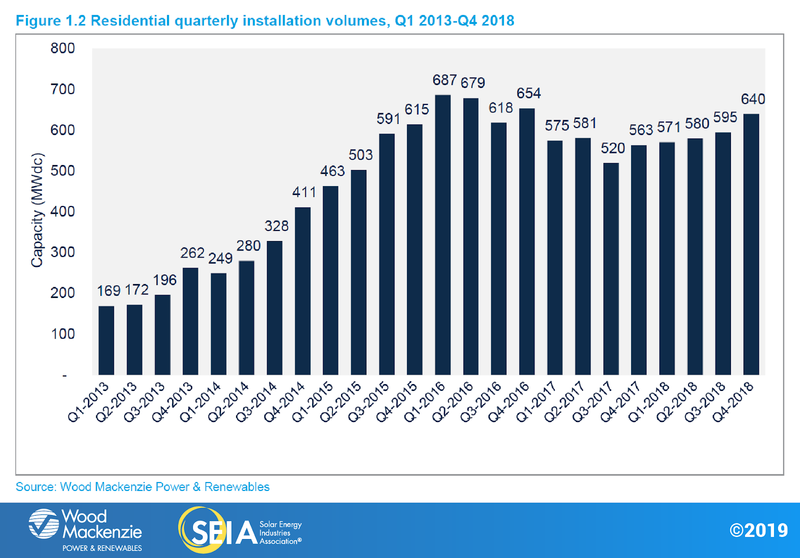 After experiencing volume contraction last year, the residential solar market regained its footing in 2018 with steadily increasing installation volumes. The fourth quarter of 2018 was the largest quarter for the residential segment in two years. Five quarters of modest growth now suggest the market is adopting a more sustainable growth profile with a mix of local and regional installers operating alongside national installers. With 2018 in the books, a few key themes have emerged about the state of the residential solar market. Installation growth and market penetration levels suggest major states have moved past early adopters. Among the highest-penetration markets in the nation, residential growth rates were mixed in 2018. 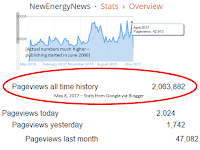 The one exception to this was Nevada, which experienced 3x growth once net metering was reinstated in 2017 after being revoked in 2016, which caused the market to contract by 61% from 2016 to 2017.This political turmoil led to abnormally high installations in 2018 based on pent-up demand. Outside the stabilizing large markets, growth in low-penetration emerging markets, such as Texas and Florida, continues to add to the geographic diversity of the residential market outside of California and the Northeast. Legacy markets are no longer the primary engines of growth. Though California is forecasted to be the largest market for the foreseeable future due to the sheer size of the state, the regional growth landscape began to shift and diversify in 2018. Of the top 10 markets in 2017, six markets experienced annual contraction in 2018 while two experienced double-digit percentage growth. Meanwhile, a handful of states are leapfrogging developed markets. Both Texas and Florida saw installations that surpassed legacy markets Maryland and Massachusetts last year, signaling new state-level leadership on residential solar development. In 2018, we saw a pivot away from legacy, incentive-driven markets and the emergence of low-penetration markets with limited third-party ownership options, good PV resources, and low electricity rates – a trend we expect to continue. Residential PV continues to be constrained by high costs of customer acquisition. Outside of overhead and margin, customer-acquisition costs remain the highest expense for installers of all sizes averaging 20% of the total system pricing. This reaffirms our view that at existing prices, sales and marketing is a vital part of continued residential market development. High customer-acquisition costs are directly related to high overall cost of installation, which also suggests a virtuous cycle of reduced costs. 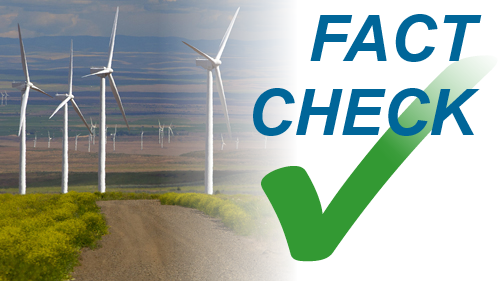 One target area for the industry to reduce costs is through streamlining the permitting and inspection processes, as permitting delays lead to customer attrition and other expenses. SEIA and the Solar Foundation, along with numerous companies, are working together to address these issues. New construction and roof replacement markets also represent an opportunity to address both customer-acquisition and permitting costs. However, at existing price levels, the high cost of customer-acquisition will slow growth in the near-term. Incentives and net metering remain important market enablers but show diminishing rates of return. While utility attempts to roll back net metering have been an issue in years past, this was not the case in 2018. No substantial revisions were made to residential NEM values in 2018 other than in Connecticut. In prior years, impending changes to NEM, other state-level incentives, or rate structures have created demand pull-in. 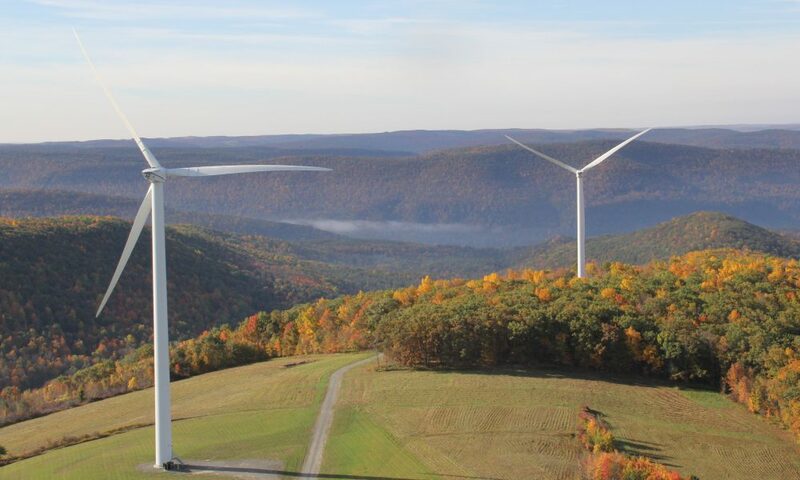 Despite anticipated changes to incentives and NEM in 2019-2020, the major Northeast markets collectively saw no growth in installation volumes. This suggests that while changes to NEM policy and other incentives have greatly impacted growth in years past, 2018 marks a year of market maturation. While strong NEM policy remains an essential foundation for rooftop solar adoption, future growth across legacy markets will require technology and business-model innovation to tap into new customer demographics. Meanwhile, California’s new home solar mandate may signal the next phase of solar market adoption. 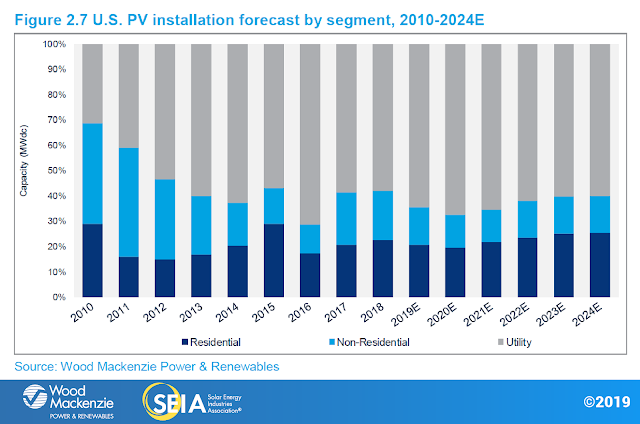 The California Energy Commission’s decision in early 2018 to require solar PV on all new homes beginning in 2020 significantly insulates our long-term forecasts by adding an additional gigawatt of residential demand from 2020-2024E. While it remains to be seen whether other states will follow suit, some municipalities have created solar mandates for new buildings. Meanwhile, major national installers are spending considerable resources building relationships with housing developers to comply with California’s mandate while also aiming to capitalize on one-off housing developments outside of state mandates. With several newly announced entrants into the space, new home solar, whether mandated or voluntary, could provide an opportunity to bridge the cost of customer acquisition gap that has constrained growth. 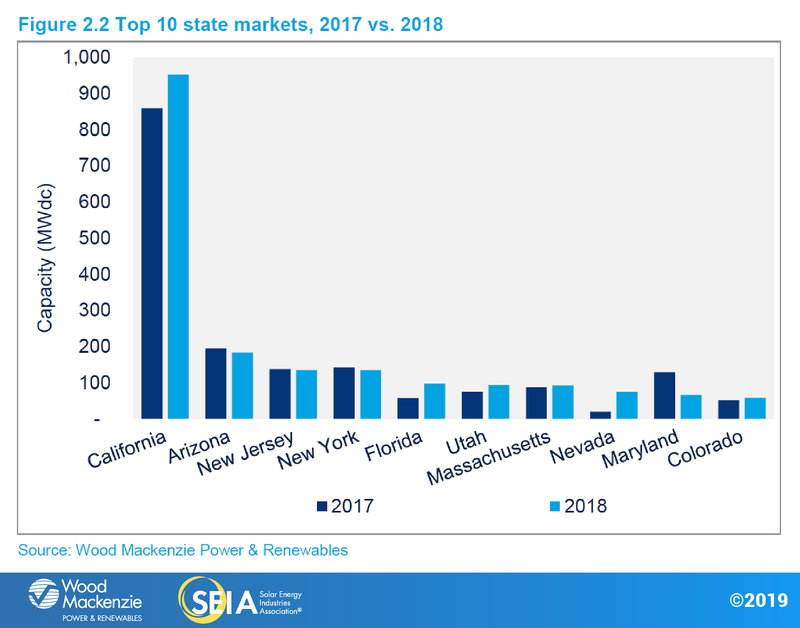 Unlike the case of residential PV, a handful of state-specific regulatory cliffs and policy reforms took effect in 2018, which led to a decline in non-residential build-out in the major markets of California and Massachusetts. Despite California’s market falling 17% year-over-year, the decline was not as severe as previously anticipated, as the extent of California’s pipeline of projects grandfathered in under solar-friendly time-of-use rates has been higher than previously assumed. However, Massachusetts witnessed 64% year-over-year decline in capacity installed as the industry awaited the start of the Solar Massachusetts Renewable Target (SMART) program. Combined, these two states saw a year-over-year decrease of more than 450 MW of installed non-residential PV capacity. New York bucked the national trend, experiencing record installations in 2018. 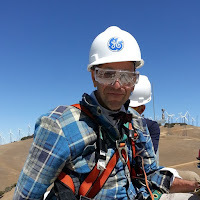 This was the result of a waning pipeline of grandfathered remote net-metering projects becoming interconnected, despite being constructed in 2017. 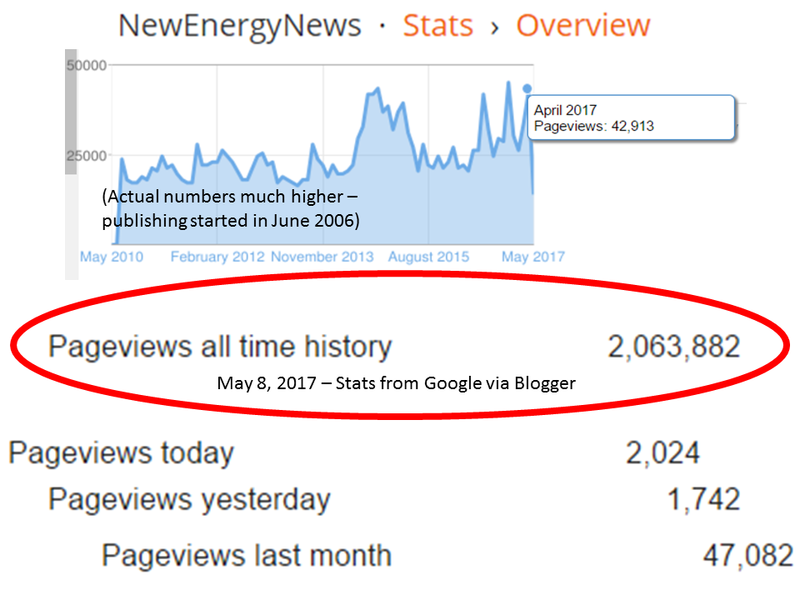 Meanwhile, community solar continues to support non-residential PV. Minnesota and Massachusetts contributed to well over 500 MW of community solar being installed this year. And while we won’t begin to see projects from New Jersey’s new community solar program until late 2019 at the earliest, the state is making significant strides in establishing the program, which technically kicks off in Q1 2019. Utility PV continues to hold the largest share of annual installations in the U.S. solar market with a total of 6.2 GWdc in 2018, accounting for 58% of total U.S. annual capacity additions. Lower-than-expected installation volumes in Q4 are primarily attributed to Section 201 module tariffs set in January 2018 and implemented in February 2018, which caused project sponsors to reassess a handful of project timelines and push out target commercial operation dates (CODs) from 2018 into 2019. In addition to tariff-related delays, interconnection delays for PURPA projects in the Carolinas contributed to lower-than-expected Q4 deployments. 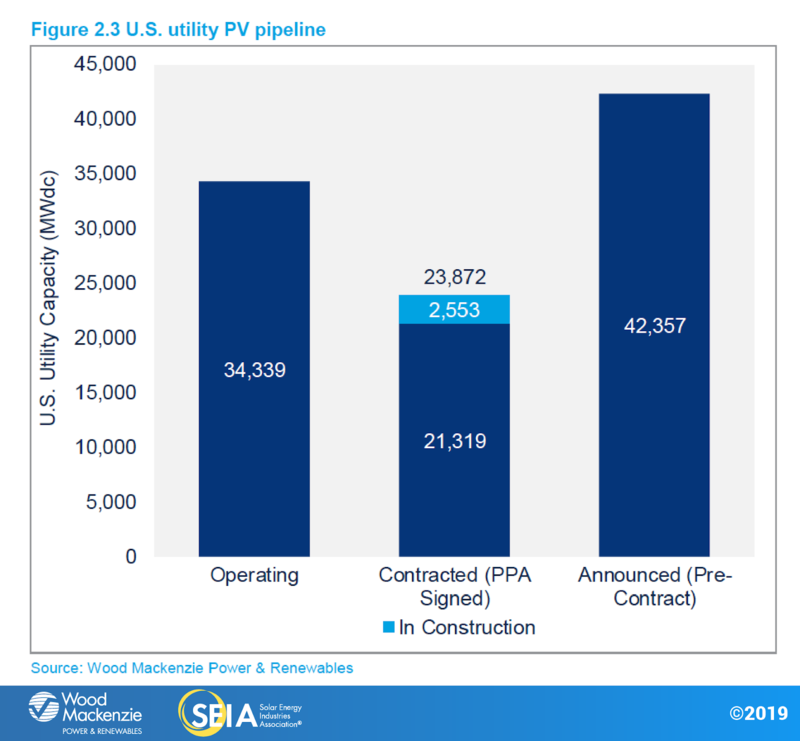 U.S. utility solar procurement has grown considerably with a number of utilities, such as Hawaiian Electric Company and Entergy Mississippi, announcing plans to add more utility PV to their generation portfolios due to the pure economic competitiveness of solar. In 2018, 13.2 GWdc of utility solar PPAs were signed, driving the contracted pipeline to 28.3 GWdc – the highest point in the history of U.S. solar. Most of these PPAs will be fulfilled with products imported after significant declines in the Section 201 tariffs. 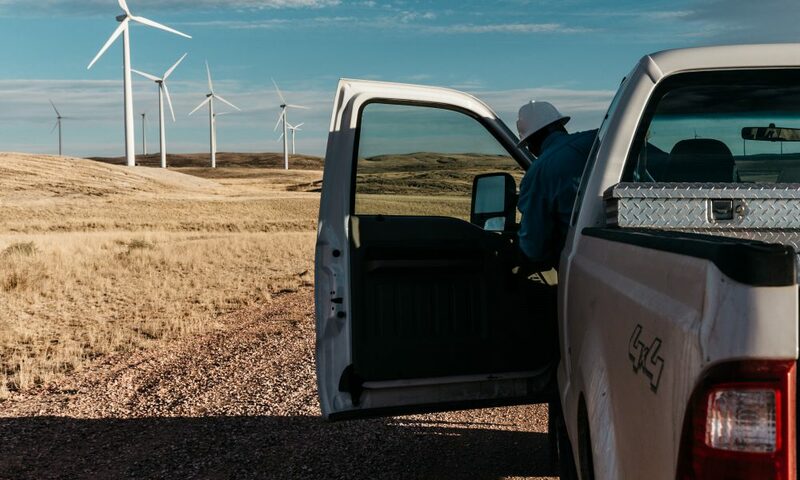 Voluntary procurement remains the largest driver of new PPAs signed and is expected to drive 51% of 2019 capacity additions. 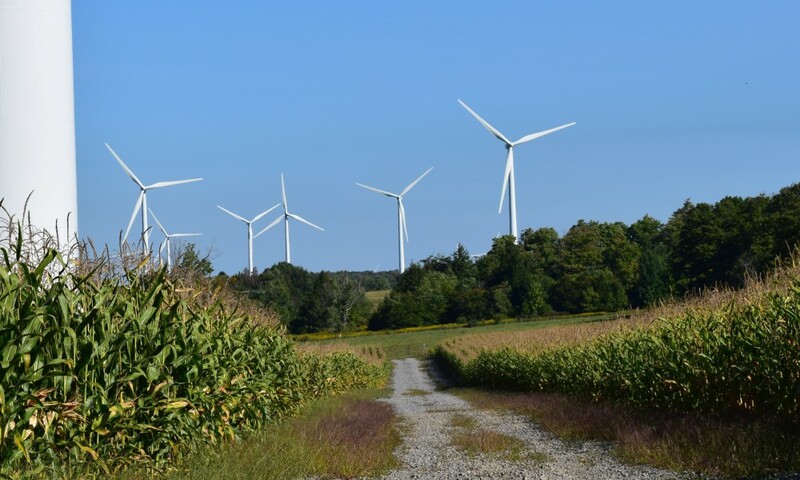 While commercial and industrial (C&I) off takers only accounted for 153 MW of actual capacity additions in 2018, C&I procurement drove 21% of all new PPAs signed last year. Meanwhile, new renewable portfolio standards are poised to drive additional utility PV. Many utility PV projects suffered disruption, delay and even cancelation due to the uncertainty leading up to the imposition of the Section 201 tariffs. The impacts can be seen in the volume of installations in 2018, which were down 7% year-over-year for utility-scale PV. However, since the tariffs were announced, the industry has pushed out timelines to account for the tariff stepdown schedule and has benefited from faster-than-expected declines in global module pricing. These price declines are mostly due to changes in China’s feed-in tariff policy that has resulted in a supply glut. 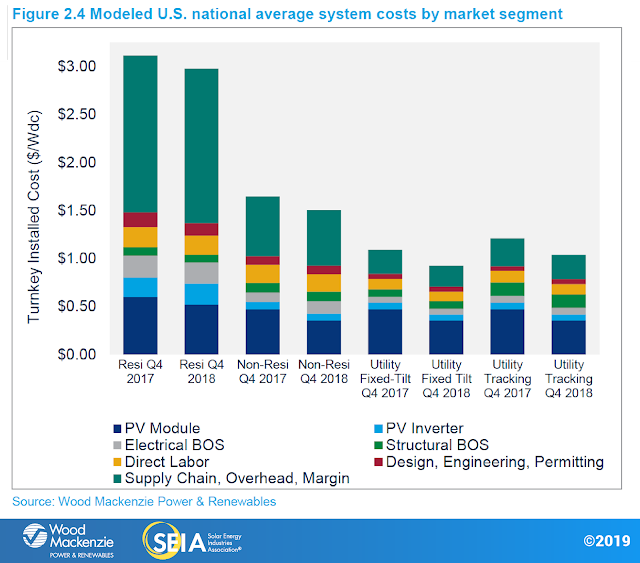 While the Section 201 tariffs are still imposing a significant opportunity cost on the U.S. solar industry, new project procurement is moving forward thanks to strong industry fundamentals. Cell and module tariffs dropped from 30% to 25% in February 2019. Tariffs will drop to 20% in February 2020 and 15% in February 2021 before their scheduled expiration in February 2022. The International Trade Commission (ITC) will conduct a mid-term review of the tariffs starting in January 2020, at which point the President will have the opportunity to continue, modify, or terminate the tariffs. The ITC will begin data collection for that review this summer. For utility PV, the downside to our 2018 forecasts benefits 2019 - the 2019 forecast has been increased from 7.2 GWdc to 7.8 GWdc as projects have pushed out target completion dates, and 2.1 GWdc of capacity is already under construction. 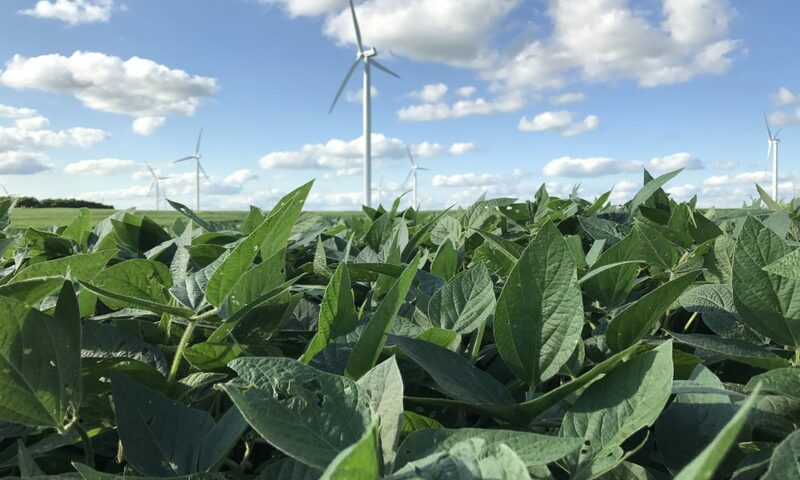 The forecasts for 2020 and 2021 have increased to 10 and 10.4 GWdc, respectively. Of the projects announced in 2019, 68% have 2020 or 2021 target CODs, significantly boosting confidence in the near-term forecast. And we expect to see at least half of 2023 capacity additions leverage a 22% or higher ITC. Finally, growth will continue into 2024, driven by current utility IRPs for solar capacity along with the economic fundamentals of utility solar projects. After examining the risks of advanced procurement, many project developers now seem more open to anchoring projects in 2019 to claim the 30% ITC and bringing them online in 2021 or later. Still, several developers have suggested they will assess each project on a case-by-case basis. Commercial and industrial procurement is expected to remain a strong driver of utility solar over the next several years as the number of companies pledging to meet 100% renewables or zero-carbon targets increases. Renewable portfolio standards (RPSs) are also poised to see a resurgence as a driver of utility PV. Many of the newly elected governors are in states that have joined the U.S. Climate Alliance or campaigned on a pledge to join the Alliance and commit to the Paris Agreement in lieu of federal participation. Six of the governors have proposed increases to RPS targets, while three (Colorado, Nevada, and Illinois) have proposed 100% RPS mandates. This is in addition to California’s 100% RPS, Hawaii’s 100% RPS, and New York’s 50% RPS. If all states where elected governors campaigned on RPS increases were to achieve 50% RPS compliance by 2030, it could drive up to 37.0 GWdc of additional solar. Wood Mackenzie’s utility PV five-year forecast has increased 2.3 GWdc since our last report as more projects are announced, utilities include more solar in long-term resource planning, and development is driven increasingly by C&I offtakers. For residential PV, after seeing 7% growth in 2018, we expect flat to tempered growth in 2019, primarily due to major market maturation resulting in limited long-term growth opportunities in major Northeast markets. Meanwhile, the approval of a super off-peak rate in Southern California Edison territory – the second-largest utility in the nation for solar PV – takes effect in 2019, which severely limits the economic attractiveness of solar-only products. That said, growth resumes in 2020-2021 as the ITC step-down is expected to pull in demand in both legacy and emerging markets before declining in 2022. Growth resumes in 2023 and continues into 2024 based on economic fundamentals as the market adjusts to the post-ITC reality. 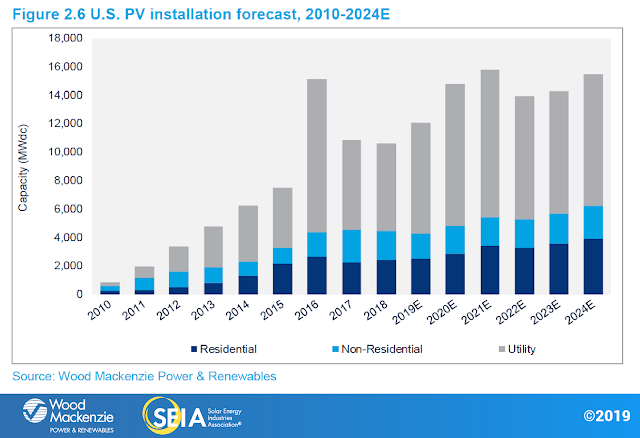 In the long-term, residential capacity growth will be driven by California’s new home solar mandate – with upside potential from other states adopting similar mandates – a robust incentive program in Illinois, emerging markets like Texas and Florida becoming the new engines of retrofit growth, and the proliferation of solar-plus-storage. Meanwhile, the non-residential PV market is on track for another down year as the segment acclimates to a reduced incentive environment across major state markets in 2019. However, this will be incrementally offset starting in 2020 as the next wave of states with robust community solar mandates – New York, Maryland, Illinois and New Jersey – begin to see the realization of those pipelines. Increasing solar-plus-storage viability will also begin to have an impact on non-residential demand. By 2023, roughly 30% of non-residential PV will come from community solar, and ~20% will come from solar-plus-storage projects.